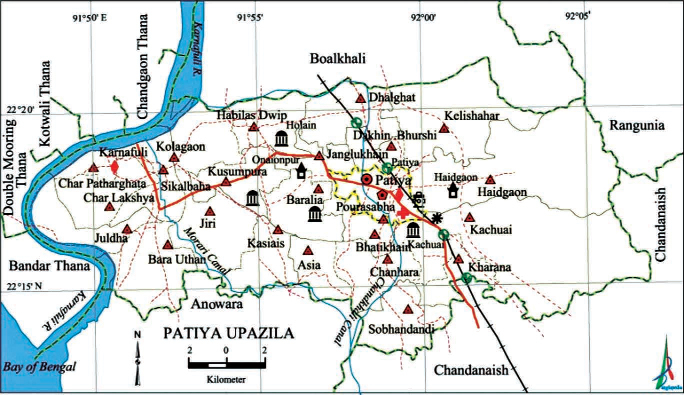 Patiya Upazila (Chittagong district) area 298.62 sq km, located in between 22’13’ and 22’21’ north latitudes and in between 91’47’ and 92’07’ east longitudes. It is bounded by Boalkhali upazila on the north, Chandanaish and Anowara upazilas on the south, Rangunia and Chandanaish upazilas on the east, Chandgaon, Bakalia, Kotwali, Double Mooring and Bandar Thanas on the west. Population: Total 456275; male 238157, female 218118; Muslim 370232, Hindu 76959, Buddhist 617, Christian 8329 and others 138. Water bodies: Main river: Karnafuli; Morari and Chandkhali canals are notable. Administration Patiya Thana was formed in 1950 and it was turned into an upazila in 1983. Archaeological heritage and relics: Musa Khan Mosque (1658), Kura Katni Mosque at Harin Khain (1806), Kala Mosque at Kachuai (seventeenth century), Akbar Jami Mosque, Syed Kutub Tomb at Baralia, Bura Gosai’s Mandir, Jagannath Temple at Suchakradandi, Annapurna Temple, Jonardan Mandir, Shiva Mandir, Buddhist Monastery at Haidgaon, Buddha Padochinha Temple at Unainpura. Historical events: In the 1930s revolutionary Swadesh Roy was shot dead by the British army, and wounded Debu Prashad, Rajat Sen and Manaranjan committed suicide to avoid arrest in the hands of the British. On 16 February 1933, many revolutionaries including mastarda surya sen and kalpana datta hided out in the residence of Khiroda Prova Biswas. During this time Surja Sen and Brajendra Sen were arrested by the British army. During the war of liberation in 1971 nearly 25 Pak soldiers were killed in an encounter with the freedom fighters at Dhalghat. The freedom fighters under Capt. Karim raided the Dhalghat police outpost and forced the police personnel to surrender. The freedom fighters launched’ attacks on the razakar camps at Patiya Madrasa and at the camp near Khanmohona station in which two razakars were killed; they also killed another razakar at Goplal Para of Kelishahar. A number of civilians were killed and wounded as a result of bombing for a number of times from two Pak aircrafts. On 3 May, the Pak soldiers conducted indiscriminate killing at village Muzaffarabad; they also set many houses of this village on fire. Patiya was liberated on 14 December. Marks of the War of Liberation: Mass grave 1. Religious institutions: Mosque 476, temple 37, church 2, tomb 1, pagoda 1, buddhist vihara 21. Noted religious institutions: Musa Khan Mosque, Killapara Innar Mosque, Al Jamia Islamia Mosque, Tagore Puni Mandir, Rai Bhaban Mandir. Literacy rate and educational institutions: Average literacy 59.81%; male 56.33%, female 47.16%. Educational institutions: college 3, teachers training institute 1, secondary school 49, madrasa 11. Noted educational institutions: Patiya Government Degree College (1962), Patiya Government College (1967), Hulain Saleh Noor College (1969), AJ Chowdhury College (1970), Dhalghat School and College (1918), Patiya Ideal High School (1845), Chakrashala Agricultural High School ‘(1857), Abdur Rahman Government Girls’ High School (1957), Abdus Sobhan Rahat Ali High School (1914), Muzaffarabad NJ High School (1929), Shashanko Mala Government Primary School (1935), Shah Chand Auliya Kamil’ Madrasa (1928), Al Jamiatul Islamia Kasemul Ulum (1937), Sikalbaha Ohidia Senior Madrasa (1890). Newspapers and periodicals Defunct monthly: Ovaybani, Shankha, Dakkhin Chattola, Rechhalat. Cultural organizations: Library 2, club 350, theatre group 4, cinema hall 3, women organisation 2. Tourist spots: Kharana Tea Garden, East Haidgaon Forest. Main sources of income: Agriculture 25.25%, non-agricultural labourer 5.42%, industry 1.04%, commerce 18.98%, transport and communication 4.58%, service 1.52%, construction 0.67%, religious service 22.34%, rent and remittance 3.88% and others 16.32%. Ownership of agricultural land: Landowner 44.02%, landless 55.98. Main crops: Paddy, potato, ginger, betel leaf, vegetables. Extinct or nearly extinct crops: Local varieties of Aus paddy, arahar, linseed, kalai. Main fruits: Jackfruit, guava, lemon, pineapple, water melon, papaya. Fisheries, dairies and poultries: Fishery 15, dairy 75, poultry 862, nursery 125. Communication facilities: Pucca road 50 km, semi-pucca road 42 km, mud road 510 km; railway 16 km; waterway 16 nautical miles. Extinct or nearly extinct traditional transport: Palanquin, bullock cart, horse carriage. Noted manufactories: Power station, Burz Mounted Power Station, Dry-Dock and Fishing Boat Dockyard, steel mill, cement factory, textile mill, garments factory, poly-foam, plastic industries, ceiling fan industries, packing and board, food and spices, ice factory, match factory, salt refinery and crushing, rice mill, flour mill, KEPZ, BSCIC industry town, West Patiya Industrial Area. Cottage industries: Goldsmith, blacksmith, potteries, weaving, sewing, embroidery, bamboo and wood work. Hats, bazars and fairs: Hats and bazars are 45, fairs 20, most noted of which are Thana Hat, Safar Ali Munsi Hat, Munsef Bazar, Sri Mai Korachengi Mela, Acharia Mela, Surjabrato Mela, Rath Jatra Mela, Thegorpuni Mela and Mahira Khetropal Mela. “Main exports: ‘Salt, guava, lemon, jackfruit, potato, vegetables. Access to electricity: All the wards and unions of the upazila are under rural electrification net-work. However 55.95% of the dwelling households have access to electricity. Natural resources: White clay with aluminium, special quality sand of Shreemai Canal, Patiya Reserve Forest.